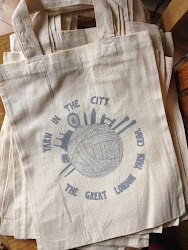 Yarn in the City: The Great London Yarn Crawl: Call for yarn-y volunteers! While we're hoping you're all stoked for the opening of registration on Wednesday, 10 July, 2013 at 7pm GMT, we're also hoping that some of you may be interested in volunteering for, or know good trustworthy fibre-folk that would make excellent volunteers, for our inaugural Great London Yarn Crawl. One final note: Because we're not sure how many people will come forward as volunteers, or how quickly ticket sales will go, we'd like to suggest that if there's a particular route that you're interested in being on that you go ahead and purchase a ticket for that route. If you do end up as one of our volunteers, we will refund you the registration fee! Our call for volunteers is still open, and we hope to have all our volunteers in place by the beginning of September. Join us!